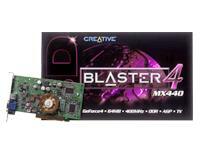 For amazing GeForce4 performance and value, trust the outstanding 3D Blaster 4 MX440. Its powerful combination of NVIDIA nView display technology, Lightspeed Memory Architecture II and Accuview Antialiasing - all delivered via a new 256-bit graphics processor with 64MB of DDR memory at 400MHz - give it exceptional performance. For users who demand speeds like a 1.1 billion texel/second fill rate, 34 million triangles/second and 6.4GB/second memory bandwidth, it's the perfect choice, giving exceptional control over display options and incredible graphics quality. With AGP 2x and 4x compatibility and dual TV and monitor output, it's the best choice for the enthusiastic user.